When I first started knitting, I had no desire to design anything. I figured, the pros have done a great job, and I can just use what they have made. This has worked quite well for me, as there a ton of really talented designers out there. The past couple of weeks, though, I have been itching to try my hand at it as well. I’m not an artist. My husband (who is one) taught me how to draw an egg. It took me nearly three months to get the shading right so I had a 3D looking image. A couple months later, I was able to do a decent strawberry. Now? I can still only do the egg and the strawberry. My husband is very encouraging, but even he got a kick out of me deciding I wanted to design knitting patterns without any art experience. He even asked more than once yesterday if I wanted him to help with the designs. Nevertheless, supportive as he is, he bought me graphing paper and Alice Starmore’s Book of Fair Isle Knitting last weekend. I was quite thrilled with it all, but did not really do anything with it until this weekend. Knowing I would need a lot of practice, I spent the weekend colouring in boxes and doodling, trying to get a feel for what I was wanting to do. The book is now filled with tabs marking which patterns I want to try out. The nice thing about knitting is I can put all the design in boxes. I do not necessarily have to have the perfect contour or shading. I am filling in little boxes. Somehow, that really works for me. I’m not saying I’ve got this down pat, but I’m much less intimidated. The design in the picture is just a doodle I did this morning. 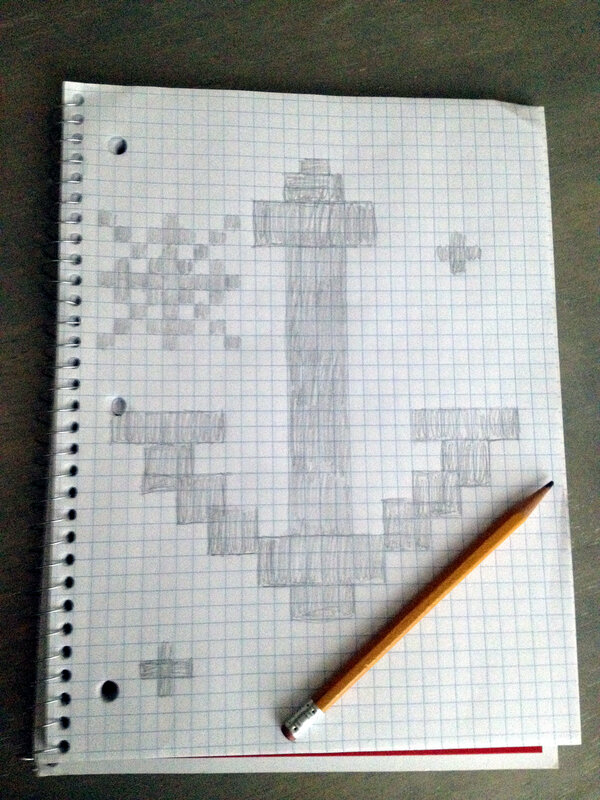 I really love nautical knits, and I wanted to try my hand out on an anchor. I’m not 100% happy with it, but this is only practice. I was imagining a little girl’s jumper with this on the front. I’m still working on it, though. The main reason I’m doing all this is I really want to design all of the stockings for this Christmas. That is a lot of work, I know. I want to mix Scandinavian and Fair Isle design in these patterns, but I’ve not really settled on how yet. We’ll see. After I finally nail down a design, I’ll have to do that one thing I dread most: swatching. I haven’t swatched with colorwork before, so this could be interesting. What were you up to this weekend? Hopefully it was cooler than ours; we had no AC and very close to 100 degree weather. Anchors are not the easiest thing at all!!! I knitted a TinTin’s Captain Haddock’s baby sweater and had to ask own husband to draw the design…It’s specially important to mind GAUGE when attempting to knit an anchor that looks like a proper anchor. You’re well on your way if you can deal with an egg and a strawberry! !